I’m so spoiled by these in-the-hoop little bags. I’ve made them before, and on a day when I want to be productive, they are perfect. They don’t require a lot of concentration, and they stitch up pretty quickly if you build them assembly line style. I have learned to cut my fabric and batting ahead of time and line it all up on an extra table. I add in the matching zipper, and it’s ready to go. I love these bright layer cakes from Bonnie and Camille for projects like this. “Little Ruby” suited me just fine. But the advantage of a layer cake is that most of the cutting is done. All the pieces are 10 x 10 or various cuts by 10 inches. I cut the sticky back tear-away stabilizer all at the same time as well, and that’s ready to go. 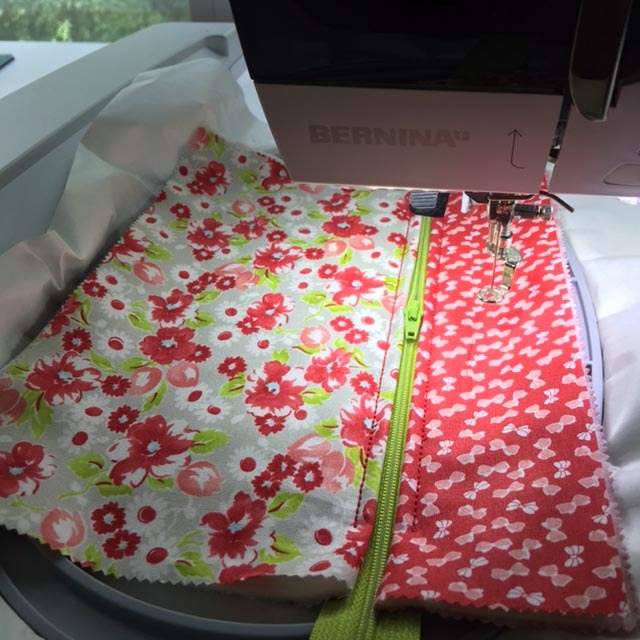 I stitch everything down on all the bags, take them out of the hoop and toss them aside while the next one sews out. When they are all sewn, then I sit down and pull out the tear-away stabilizer, trim the edges and finally, press. Tonight, I’ll head to the store and see if I can find some little charms to add to the zippers. 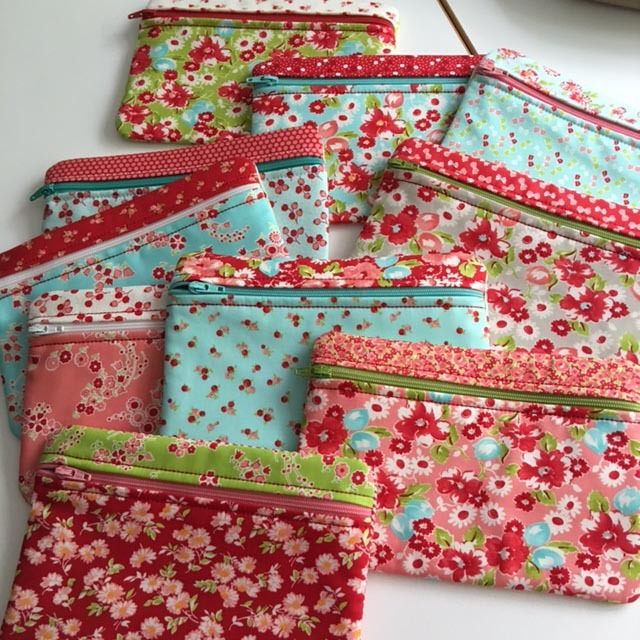 People just love these little bags…they can be used for anything. The bright color combinations are so cheerful. I think I’m going to see if I can make some that use charm packs. These are “cosmetic bag” sized. Charm packs would be “coin purse” sized, but they would really go fast, and I might be able to put a few in a hooping. That will have to be my next experiment. 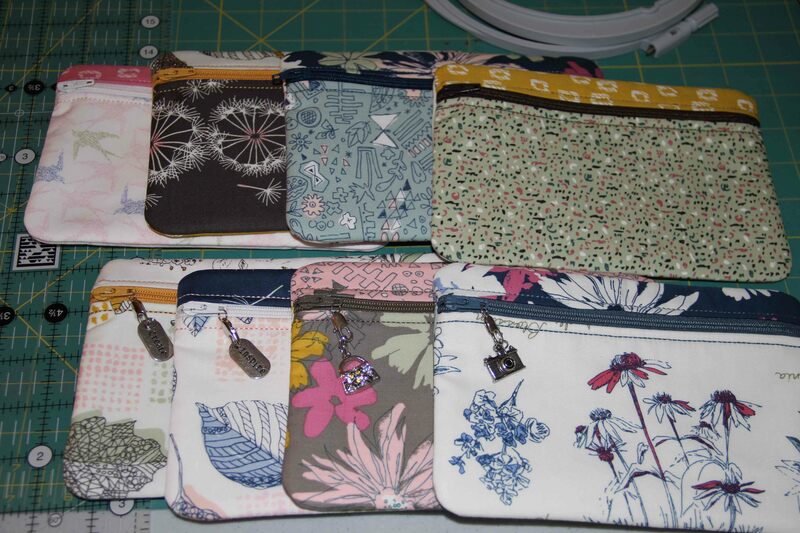 I’ve been making these little cosmetic/chotchke/jewelry bags now for a couple of days. So easy and fun to make. All the ones I’ve made (8 of them in total, so far) are made from Art Gallery Fabric, Sketchbook. 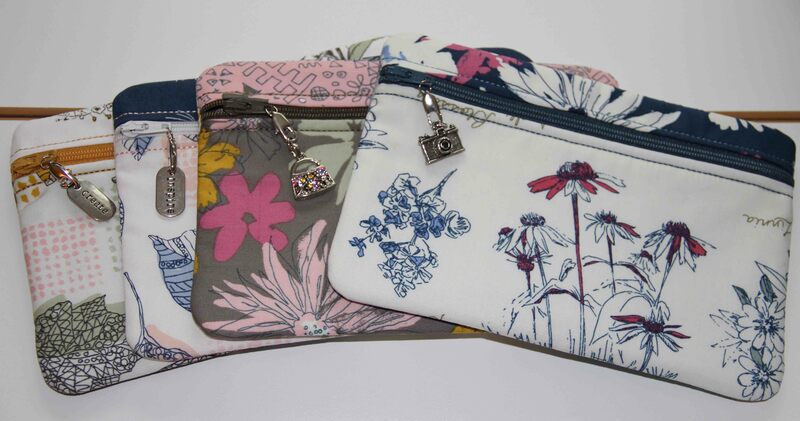 The look of the fabric is artsy and lends itself well to these small bags. They are approximately 6 x 8 in. finished. These are all done in embroidery, by the way. 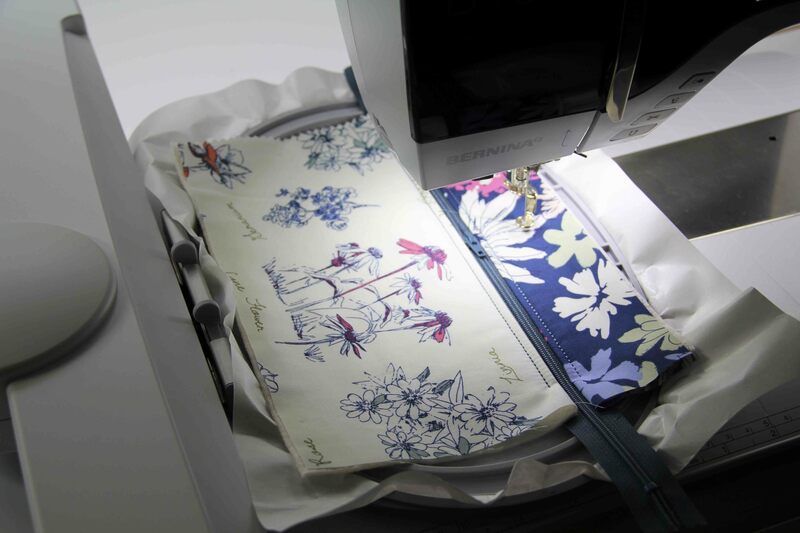 I digitized the lines for the bags, and all the work is basically in the cutting of fabric. First stitch is a placement for the zipper, then you lay down the zipper, then folded fabric with batting in the middle across the top of the zipper, stitch a line, same thing with the bottom layer of fabric, stitch a line, then lay the lining/backing down (a quilt sandwich) and stitch around the outside. Voila! That’s it. You’re done. Trim and turn it inside out. You use a sticky back stabilizer, so you end up picking that off the back at the end, but other than that, these bags go REALLY FAST. Use batting in between every layer to give the bags a nice hand. I’m thinking these would make great holiday gifts. I have gone through my stash and have come across some old home dec fabric that I think would be fun. Denim would also be great. Who doesn’t have an old pair of jeans that need to be repurposed into new life? Add some embroidery or a little bling…anything is possible. These in-the-hoop projects are great stash busters. Gotta run, I need more zippers.